You are right, green wgon with gray roof. Who can tell me what color was this wagon? Green, or may be red, like this car? Letzte Änderung: 21 Apr 2016 17:13 von Sandro. Were this wagons green with black roofs? Letzte Änderung: 13 Mär 2016 12:46 von Sandro. Hello everyone! Sorry I'm writing in English I'm from Moscow. We have a community of N scale rail road models fans. 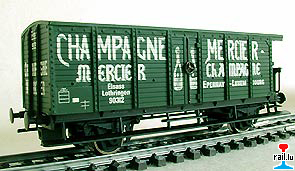 I have a question about an old wagon of Champagne Mercier which I found on Rail.Lu. I want to make a small batch in N scale. another with number 30911 and the model with 30912. I want to manufacture a set of three wagons with the numbers 30911, 30912, 600391. Are this right numbers for the set of this wagons? Why there were the wagons with the numbers of 5 digits and 6 digits? 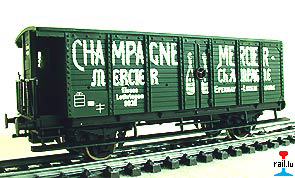 As I understand this wagons were in dark-green color with white letters? Letzte Änderung: 22 Nov 2015 23:18 von Sandro.